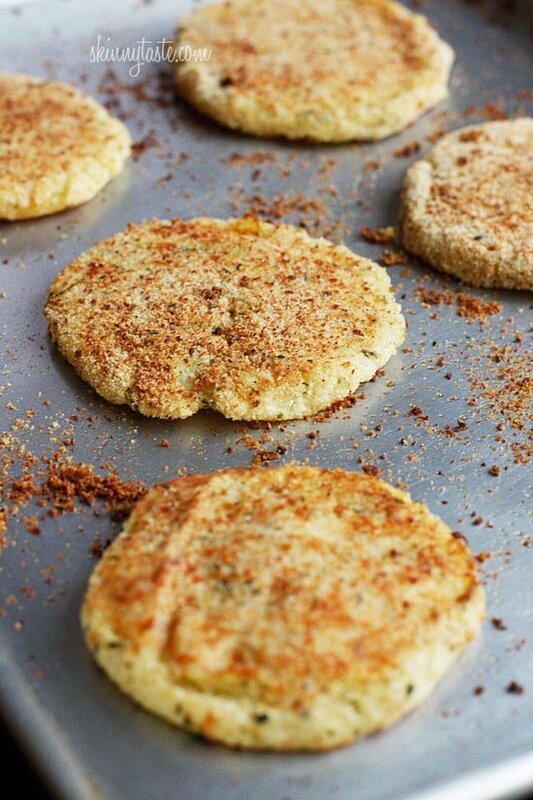 These parmesan mashed potato patties are so good, you’ll want to make sure you have leftovers next time you make mashed potatoes!! I love making these patties whenever I have leftover mashed potatoes so I don’t feel like I’m eating the same thing the next day. Serving size will change depending on how much mashed potatoes you have leftover. I wrote this recipe assuming you have half a batch of leftover skinny garlic mashed potatoes. This works best with cold mashed potatoes. Preheat the oven to 425°. Spray a baking sheet with cooking spray. Fill a small bowl with egg whites, whisking well. Fill another bowl with the breadcrumbs and parmesan cheese, mix to combine. 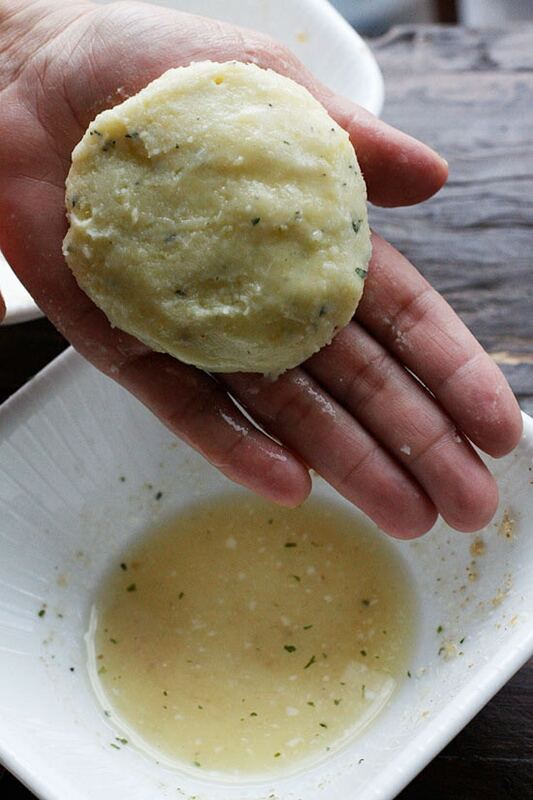 Using a 1/3 cup measuring cup, form potatoes into 8 patties. Brush patties with egg whites (or you can use your hands to spread egg on), then dip into breadcrumb mixture. Place patties onto the baking sheet and spray the top with more cooking spray. Bake for 15 minutes, or until the bottom becomes golden brown; flip and cook an additional 10-12 minutes, until golden on both sides. I know this post is a few years old, but if still wanted to share. I will never post a review of a recipe that I've completely changed. But, I needed to tell you how this recipe inspired me tonight and I ended up with a winner of a side dish! I had leftover mashed potatoes, wanted something different, so I came to your site (of course) looking for a lightened potato patty, or as we call them, potato pancakes. I found this recipe. But I realized that I really didn't have enough leftover potatoes. So I grated about a cup of zucchini, salted and drained it for 20 minutes or so. I mixed the zucchini, about 1 1/2 cups of potatoes, some minced onion, parm cheese, egg white, a bit of flour, baking powder, s & p. I did not bread them. My griddle was still on the counted from last night. So I just sprayed it and cooked the patties on the griddle. They were absolutely delicious!! I will soon make your potato patties and zucchini pancakes as written! But, one of the things I really like about your site it how easy your recipes are to make your own. I'm on a medical very low fat diet (<30 g/ day) and I struggle to keep weight on. That makes me very different from most of your readers. It is certainly a challenge to maintain a diet that low in fat. But, I can easily adapt most recipes from your site to keep me in the nutritional zone that will help keep me out of the hospital. I am a cook, I love to cook. 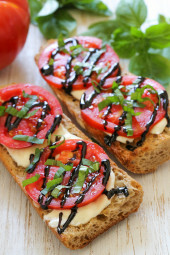 When I got sick, my hubby and I were determined to prove that low fat doesn't mean low flavor! Your recipes inspire me, give me variety when I get tired of thinking of new things to make, or just don't have it in me to try. Most importantly, your recipes help make me feel like I'm eating like a normal person. I'm sorry this got so long. Thank you, Gina, is what I wanted to say! Of course I had to try them as soon as I found this recipe. I am a big fan of everythin that's made of potatos. It was absolutely delicious. Thanks for the instructions! Hi, Gina! 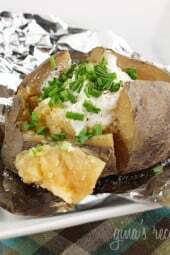 Just wanted to let you know that I used this recipe, along with your Crock Pot Picadillo, to make some delish Papas Rellenas! Thanks for the lightened up Hispanic food – it makes this Cuban girl happy! I made this with your garlic sweet potato mash and it turned out great! Didn't have the right breadcrumbs, so I used panko and added italian seasoning to it. Just be sure to handle gently when making and flipping. I made the Skinny Garlic Mashed Potatoes yesterday just for the sole purpose on making these patties today. They were amazing! I did have problems turning them but I blame that on the fact I forgot to spray the pan with Pam. Duh. Next time I'm going to be lazy and just place the potatoes in a shallow dish and put the crumb mixture on top and maybe broil for a minute to crisp them up a bit at the end. But man oh man, these were good!! I still have some mashed potatoes left so I'm going to use them for potato soup. It should be amazing! I so love the recipes on this site. I tried these today and they came out great. I added a bit of planko to my breadcrumbs. When turning them over you have to be gentle. Mine just fell apart as well. Yeah, tried to make these and they fell apart! I'm very much impressed with this Recipe. I certainly want to try. Where can I find the Italian seasoned Bread Crumbs? Can I prepare that at home. Please help me. 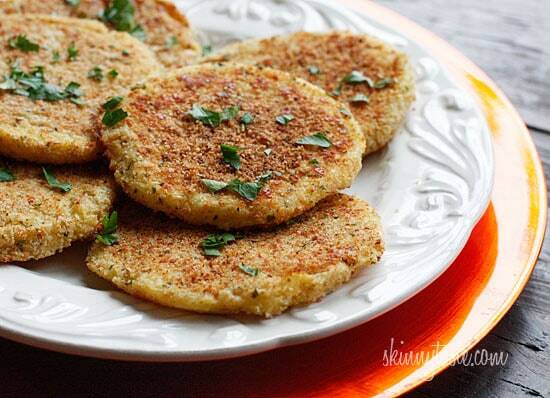 Just finished up a nice dinner of white fish and these potato cakes. Next time we are going to add some sauteed onions and mix the fish flakes with the potato and make some fishcakes. Great dish! Wow, these are amazing, love how crisp the outsides get !! I just made these and they are currently in the oven…I forgot the egg part so we'll see how it turns out! Looks delish though! Have a nice taste and good recipe to enjoy in future for all kind of persons. I just made these and took them out of the oven! What a great idea, as without this recipe, the leftover Thanksgiving mashed potatoes would have ended up in the trash! The patties were a little hard to form at first, but by the 3rd one, I got the hang of it…word of warning…take off your rings before forming patties! 🙂 LOVE! Will make again! This is great and looks so tasty. With a fresh salad and a couple of potatoes patties, that makes for a tasty meal. I made these today…what's the trick to keeping them from falling appart? They tasted delicious, but were a mess!! Aren't they great! Glad you liked them! Made these for dinner tonight. Fantastic! I used panko breadcrumbs for more crispiness. I'll be making mashed potatoes more often just so I can make these with the leftovers! Thanks for the recipe! I just made these with leftover sweet potatoes and some chopped pecans. Different points for sure, but thanks for the inspiration! Thanks again for the inspiration. Cannot wait to try these! I usually hate it when people post about a recipe before they've actually tried it, but I have to do it here. My kids are always begging me to make mashed potatoes but then they don't eat them as leftovers, so I'm definitely trying this next time I make too many mashed taters! Thanks. Last night I tried your Skinny Garlic Mashed Potatoes.. which were GREAT! I purposely saved leftovers to make these tonight! Great recipe! I always ask, should we save the mashed potatoes? My Husband always says no, there gross the next day! Well not anymore, I am going to try this recipe the day after Thanksgiving. Thanks!! I love potato patties… yum!!! Great idea! I can't wait to try your mashed potatoes too. I can't wait to make a Thanksgiving "Take Two" meal – with your Turkey Croquettes and these on the side – it will be PERFECT! Thank you! This is a fabulous idea! Yummm. Great!! Let me know how you like them! egg whites and egg beaters are basically the same thing, egg beaters adds coloring and salt I believe. 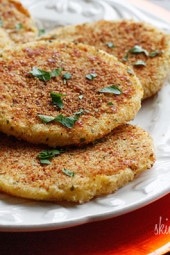 Kelly, I have a great recipe for turkey croquettes on my site! Perfect for leftover turkey, so good with gravy. Al, so glad he likes them, hope u get a chance to try them. I have left over mashed potato's in the frig so I'm making these tonight. Hubby will love them….thanks! These look tasty. I also love making my mashed potatoes into croquettes. Add a little protein into the mix in the form of fish, chicken or ham and you have a delicious completely repurposed main dish or appetizer. 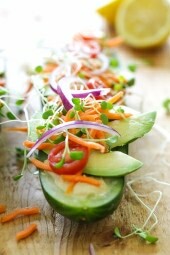 What a GREAT way to utilize leftovers? I'm a HUGE fan of doing this, actually. Just the other day I made a quinoa omelet by mixing some of my leftover quinoa & peas with a couple eggs. It came out super tasty! I really like how you put in the egg whites vs egg beaters!!! I never know what the exchange would be!!!! Ah! Ideal timing, I have leftover skinny mashed potatoes from last night. I'll try these if my husband hasn't eaten the leftovers – he says the skinny garlic mashed are the "best mashed potatoes ever" so they might be gone by the time I get home! Wow, they look great! We had potatoes planned for one dinner this week, if I've got enough time I might try making these. Thanks for sharing! Your recipes are gorgeous! Is this real life?? These look so amazing…I might make mashed potatoes JUST to do this! My husband is not a fan of leftovers, so these are great!! It's like a dish. I love this idea! No matter how much I love mashed potatoes, I know there's going to be tons of leftovers after the holidays! What a great way to use them up! They look delicious!